There are four rooms available. A deluxe king room with ensuite shower room, a double with ensuite shower room, a twin bedded room with ensuite shower room, and a family suite for up to five people with private bathroom used solely by those guests occupying the room. Breakfast is served in the guests own dining room and for relaxing there is a separate lounge for the sole use of guests with a colour television and a selection of books and board games for use during your stay. Free WiFi access is available. Situated at the front of the house, this room has a king size bed and an ensuite bathroom containing a shower, toilet, wash hand basin and heated towel rail, The room is equipped with solid oak furniture, including wardrobe, dressing table, bedside cabinets and chest of drawers. The room also has tea and coffee making facilities, a 32″ flatscreen TV (Freeview), alarm clock, thermostatically controlled radiator, hairdryer, shower gel/soaps, towels and linen. An ironing board and iron are available on request. Situated at the front of the house, this room has an ensuite bathroom containing a shower, toilet, wash hand basin and heated towel rail. The room is equipped with plenty of storage, chair and stool, tea and coffee making facilities, a flatscreen TV (Freeview) with a built-in DVD player, alarm clock, thermostatically controlled radiator, hairdryer, shower gel/soaps, towels and linen. A cot, ironing board and iron are all available on request. 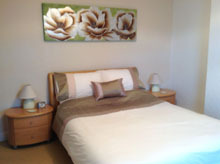 Room sleeps a maximum of 2 people plus 1 child in a cot can be accommodated. Situated at the back of the house, this the room has an ensuite bathroom containing a shower, toilet, wash hand basin and heated towel rail. The room is equipped with a wardrobe and drawers for storage, desk and stool, tea and coffee making facilities, a flatscreen TV (Freeview) with a built-in DVD player, alarm clock, thermostatically controlled radiator, hairdryer, shower gel/soaps, towels and linen. An ironing board and iron are available on request. 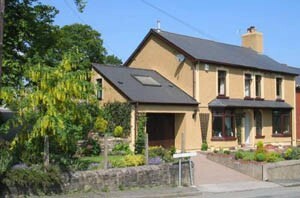 Situated at the back of the house, the family room consists of an upper twin bedded room connected by 3 steps to a lower annexe room. 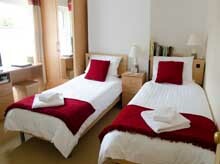 The annexe room contains 2-3 beds. 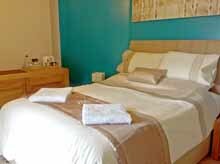 (The annexe room can only be accessed through the twin bedded room). Both rooms have bedside cabinets, drawers, wardrobes and chairs. There is a wash hand basin in the room but the main bathroom is located a few steps across the landing and is only used by guests occupying this room. Each room is equipped with tea and coffee making facilities, flatscreen TVs (Freeview) with a built-in DVD players, alarm clocks, thermostatically controlled radiators, hairdryers, shower gel/soaps, towels and linen. A cot, ironing board and iron are available on request.